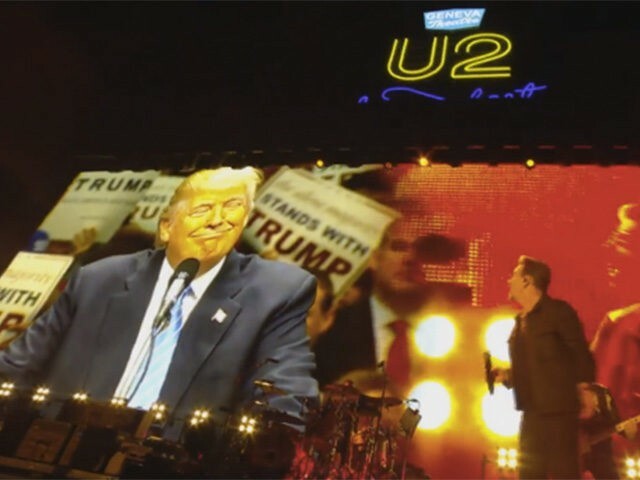 The Irish rock band was playing to a packed audience in the parking lot of the Cow Palace near San Francisco when Bono — a longtime Clinton Foundation benefactor — engaged in a back-and-forth with a video of Trump projected on the massive screen behind him. “The question we have for you this evening: What is your vision for this great nation?” the 56-year-old singer challenged Trump. “I will build a great, great wall on our southern border and I will have Mexico pay for that wall,” said Trump in video from one of his earliest campaign appearances. “Good people are not going to stay silent while you run off with the American dream!” a fired-up Bono added. According to the San Francisco Chronicle, Wednesday’s “Dreamfest” concert was held to benefit the UCSF Benioff Children’s Hospital, with tickets starting at $1,000 and running all the way up to $1 million for sponsorship packages. The event was reportedly completely sold out. Bono has become an increasingly vocal critic of Trump as the election enters its final stretch. In a September interview on 60 Minutes, the rocker called the Republican candidate “the worst idea that ever happened to America,” and someone who could potentially “destroy” the country. The singer’s name has popped up during the election in other ways; in August, emails released by Judicial Watch found that an aide to Bill Clinton petitioned the State Department to grant a request made by Bono for his upcoming world tour while Hillary Clinton served as Secretary of State.